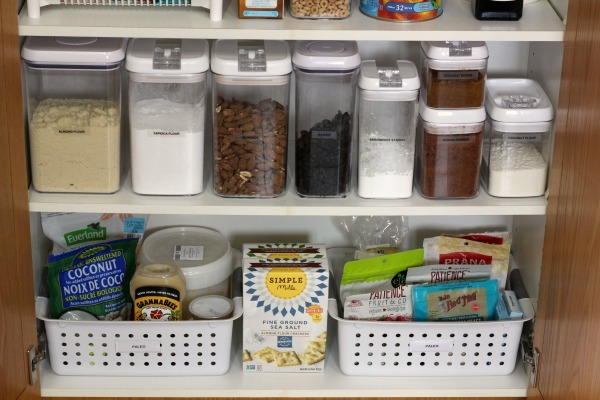 I’ve talked about my small organized pantry before on the blog. It’s a bank of cupboards in my kitchen next to my fridge. And while it may look large from the outside, the shelves are actually only 11 inches deep. A standard dinner plate doesn’t even fit inside. It’s very deceiving actually. 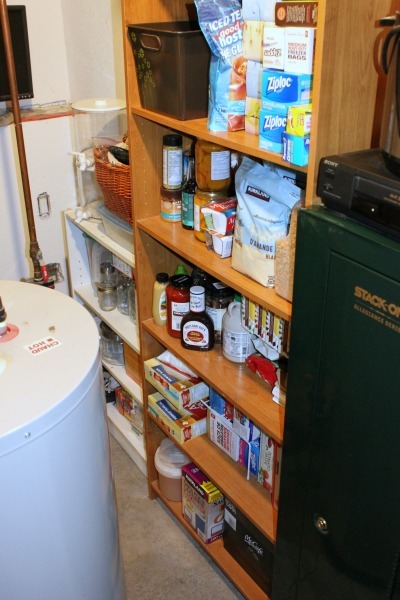 I’ve never lived in a home with a walk in pantry and quite honestly I don’t feel I even need one. Because I menu plan every single week and grocery shop accordingly, I don’t really have a need to keep a huge stock of supplies. I actually get anxious if I have too much waiting for me to use up. So let me give you an inside look at my small organized pantry cupboard. The most important thing for any organized space is containerizing it all to help you divide and conquer. You need to contain like with like and establish some limits and boundaries. I found these Sterilite bins at Walmart years ago but I don’t think they carry them anymore. However I did find them on Amazon in a set of six HERE. 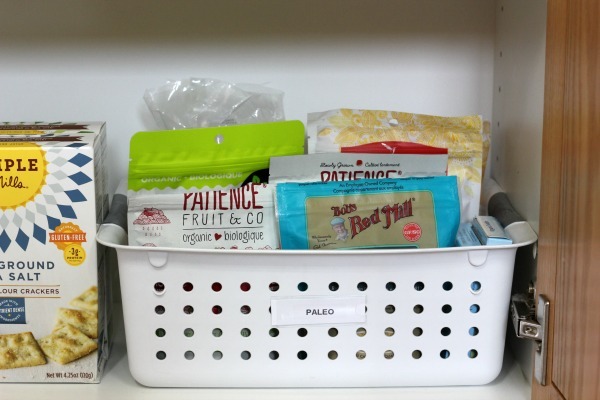 I keep bins for my Paleo foods, side dishes, popcorn supplies, candy and snacks. Of course bins make everything look neater but more importantly they contain like with like. Which means it’s super easy to find what you need but also allows you to quickly see if you are almost out of something. In some cases I get all wild and crazy and containerize within my containers. This just makes me happy but of course it’s totally not necessary. These awesome blue bins are from the dollar store. Whenever you can, always look up, way up, to maximize space. Some of the space between my shelves is larger than others. So instead of blank space sitting there staring at me, I added some great tools to fill the gap. 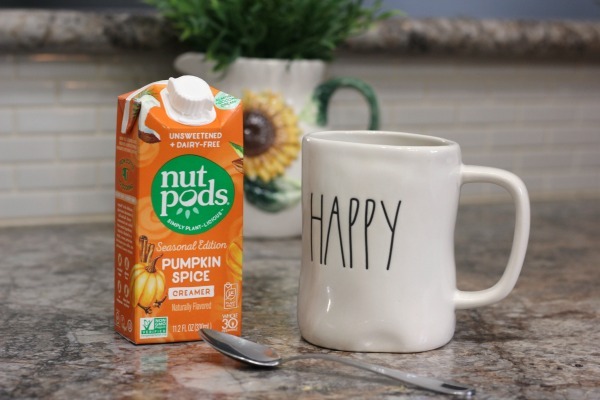 PS: These Pumpkin Spice Nutpods are soooo good! Yum! Recently I added these lovely storage containers for some of my Paleo dry goods. I’ve been eating a Paleo diet for almost four years, making the majority of my meals from scratch. Up to this point I had kept everything in the original packaging and just used clips on them to keep them closed. Since I use these items all the time, that got old and frustrating. 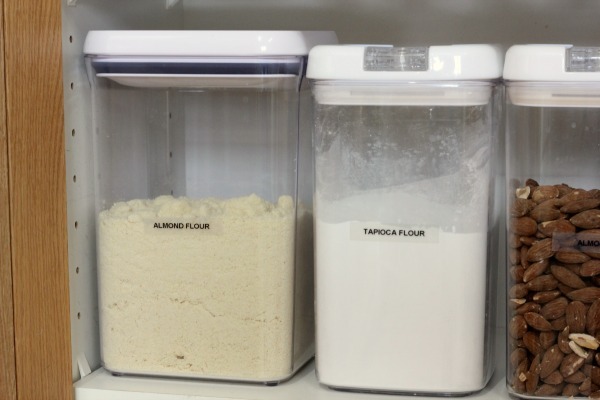 Using clear containers makes it so much easier to keep track of everything. I’ve purchased these containers one at a time as I found good deals. This last set I ordered off Amazon completed my collection and it’s been working out so well. They don’t all match and that’s okay with me. The trick here though is making sure your container is big enough to hold an entire bag of whatever it is you need to store. It’s such a pain when you have a little big leftover in the bag that you need to store elsewhere. Kind of defeats the purpose I think. So keep that in mind when looking for containers. And I don’t decant everything, just the items I’m using regularly. 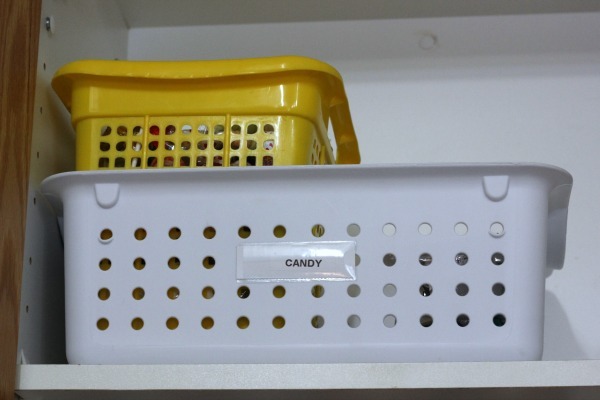 If you have multiple people accessing your pantry space, it’s a good idea to add labels to your bins. 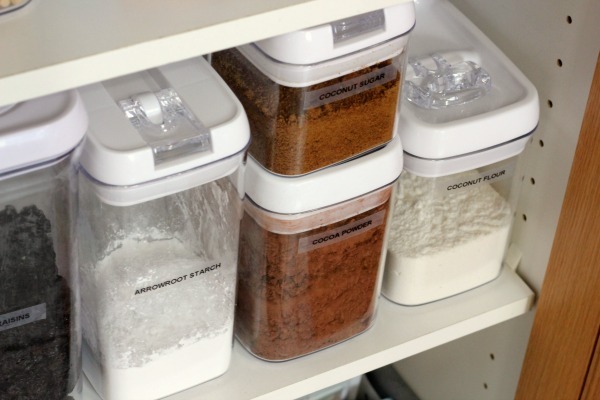 On my storage containers below I just used my favorite label maker with clear labels. 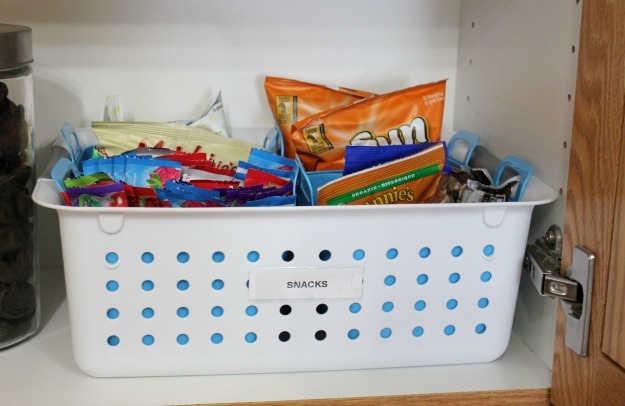 For these bins below, I print labels as above but then use label inserts to attach the labels over the holes in the baskets. Just felt a little more secure. Easy. Finally I wanted to let you know that I do have a bookshelf in my laundry room for my overstock items. It’s squeezed in between the water heater and the wall. Things stored here include extra food items that were on for a good sale or those things I stock up on at Costco which is two hours away and I don’t get there often. The bookshelf keeps me in check so I don’t go crazy hording more than necessary. It’s not a large space but it’s just large enough to have the things we frequently use on hand. One last side note y’all – don’t get hung up on having all matching bins or even the ones suggested in this post. 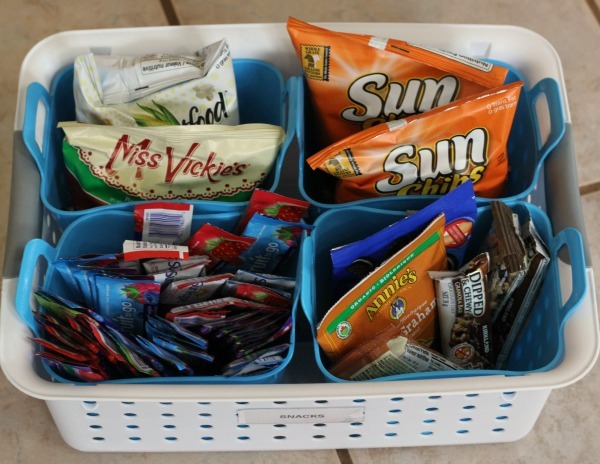 Dollar stores often have plenty of bins to choose from and if you really want to save money use cardboard boxes. Organization is what is most important first, not how it looks. Okay rant over. So that’s how I manage my small organized pantry space. 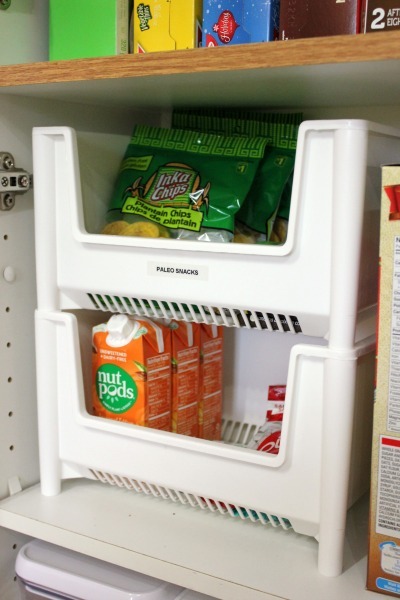 It works well for us and I wanted to share in case you too don’t have a walk in pantry closet. 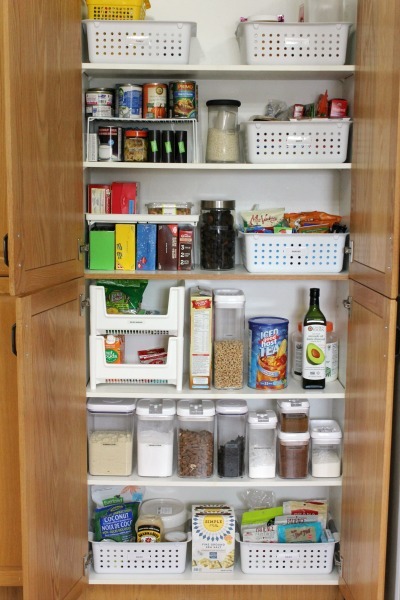 Although these tips would definitely apply to a pantry closet as well. 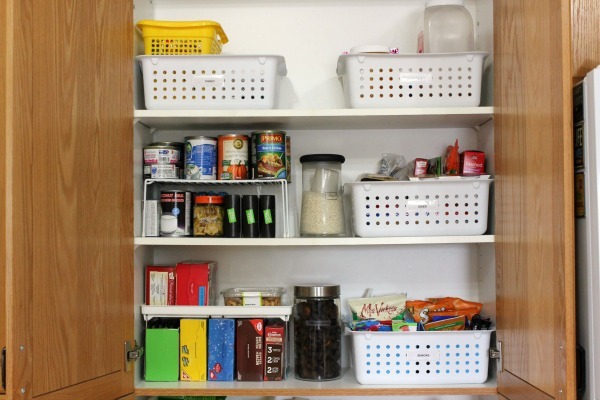 I hope they help you create a pantry that works just right for your family! Have a super day and have fun organizing. Remember, don’t complicate life more than you need to. The idea is to make life easier not harder. 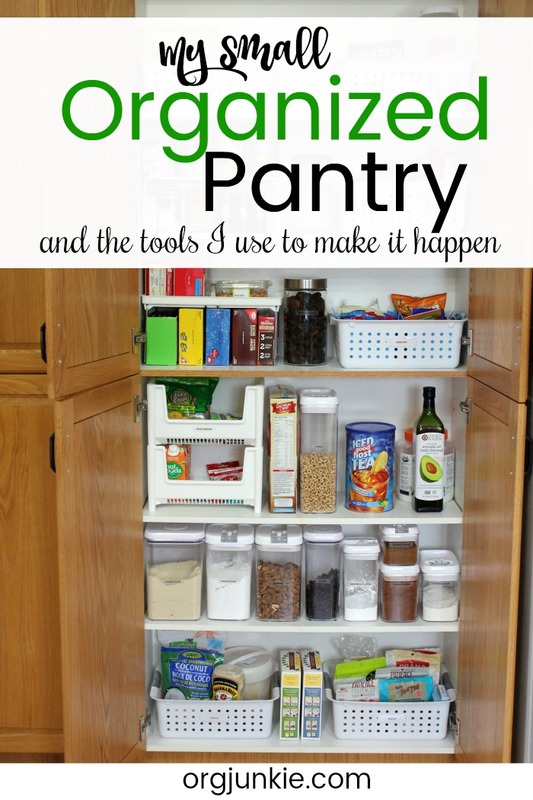 Curious about other organizing products I use? Check out my Amazon Shop by clicking on the graphic below. 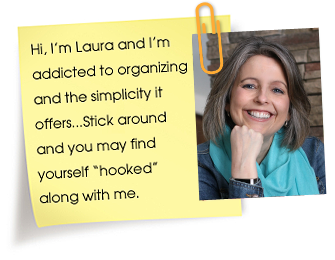 Thanks, Laura, I love your cheery posts. One kitchen cabinet I am struggling with is my upper corner cabinet that has a 2-tier lazy Susan inside. I cannot find pie-piece shaped baskets to fit the 18-inch diameter. Amazon has larger sized baskets & shelves for lower cabinets, and that was more than I saw on the Container Store website.. Any ideas on other basket types or an easy way to DIY a wedge-shaped container? I store medications and spices in this cabinet. Thanks in advance. Hi Ann, thanks for sharing your dilemma. I found these ones by InterDesign on Amazon that are the wedge type for lazy susans. Do you think they would work? 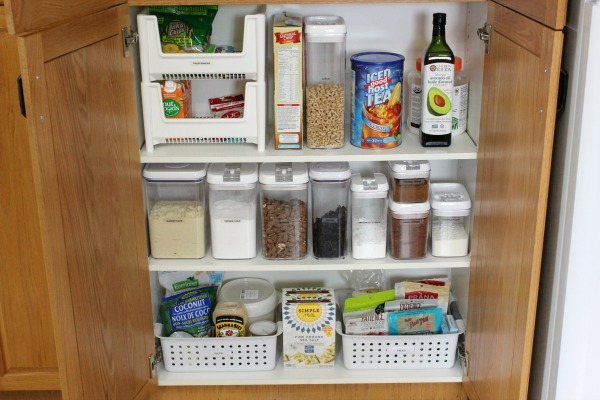 Have you seen my lazy susan cabinet organization post from earlier this year? Unfortunately all the wedge baskets on amazon are too big for my upper cabinet. Maybe I will take measurements and go to the container store for very small lazy susans, to fit on my lazy susan, or at least different baskets that fit better…I appreciate the second look at your lazy susan cabinet. Thanks for your help!